Dressed to impress. SPF clothing, sunglasses, and a large brim hat can help keep out the harmful UV rays. Long pants and sleeves can protect you from garden pests and harmful chemicals. Sturdy shoes and protective goggles should be used when operating power tools and lawn mowers. Garden gloves will keep your hands from getting cuts and scrapes. Beat the heat. Even short periods of time in high heat can cause serious illness in the elderly. Try to avoid the middle of the day. Garden in the early morning or evening when cooler. Wear plenty of sunscreen and reapply throughout the day. Take frequent breaks in the shade or go inside to cool off. Know the signs of heat stroke – nausea, headache, dizziness, rapid pulse, unconsciousness, or confusion. Keep energized. Take breaks to eat a light snack to keep you energized. Fresh fruit and vegetables are perfect to give you a much-needed boost. Drink plenty of fluids. Infuse water with fruit and ice can keep you cool and hydrated. Or make yourself a refreshing smoothie to beat the heat. Feeling drowsy. If you are taking medications that can impair your judgment, affect your balance, or make you feel tired, do not operate machinery, climb a ladder, or do activities that could cause injury. Listen to your body, monitor your physical exertion, and watch your fatigue, so that you don’t exhaust yourself. Get vaccinated. All adults should get a tetanus shot every ten years. Make sure that you are up-to-date on your shots to avoid infection. Tetanus can be found in the garden soil and enters through a scrap or cut when working in the dirt. Tend to any cuts, scrapes, or insect bites immediately. Check with your physician if you are current on your vaccination. Watch your back. Use a stool or bench in the garden to avoid bending over and strain on your back. A raised garden bed that is higher and easier to reach or a vertical garden wall or trellis are other solutions to save you from a back strain. Put it away. Once you are done with day in the garden, store gardening equipment safely away so that it is not a fall hazard to you or anyone who enjoys your garden. Hoses should be recoiled and stored. A wheelbarrow or rolling cart are helpful to gather tools at the end of the day to store away. Enjoy the exercise and fresh air that you get while gardening, but take a few simple precautions so you can keep gardening all summer long. 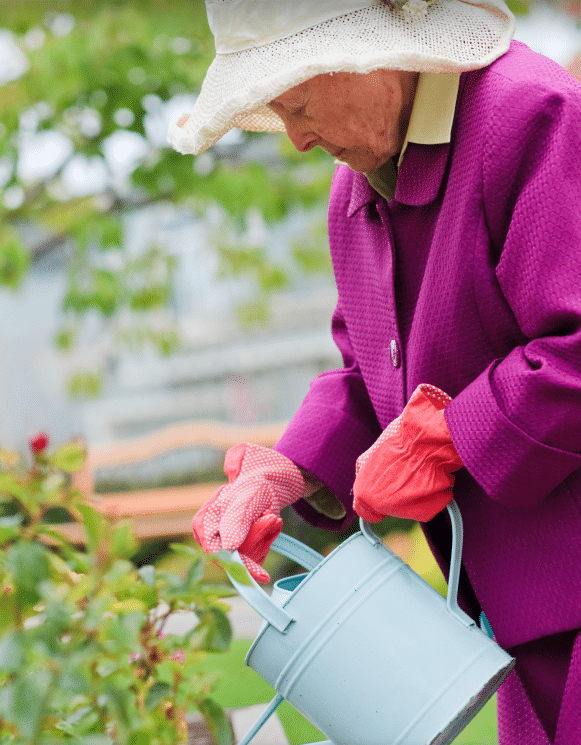 Visit your local Aegis Livingcommunity and ask about our life enrichment gardening programs.